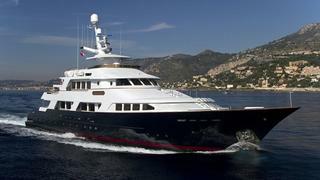 Mark Duncan at Yachting Partners International sends word of a €410,000 price cut on Gregory Gheraia's 43.28m motor yacht Antinea, a joint listing with David Legrand at Fraser Yachts. Antinea was built by Nishii Zosen in 1985 and refitted in 1991, 2001 and 2008. ABS classed and MCA compliant, she accommodates 12 guests in a master, four doubles and a twin cabin and cruises at 12.5 knots. Available for inspection in St Tropez, Antinea is down from €5.9 million to €5.49 million.